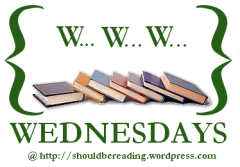 It's Wednesday and that means its time to let the world know what I've been reading. When I say the world, I mean this tiny corner of the internet that I call my blog. Hope everyone is having a good week. I did well reading wise this week but there still needs to be more hours in a day. At the moment I'm reading The First Thrid by Will Kostakis. I love this book. It's filled with so much heart, love and family. I just finished reading Through the Zombie Glass by Gena Showalter. I finally got around to reading it. It was not as good as the first book but still a good read. I also finished reading Countdown by Michelle Rowan. It had a few issues but overall it was a quick enjoyable read. I don't know what I want to read next. I'm hoping to read The Maze Runner by James Dashner and The Burning Sky by Sherry Thomas. Thanks for the warning. I will see how I go with The Maze Runner. Thanks for visiting. The First Third does sound really good :-) I hope you enjoy the rest of your books too. The First Third sounds interesting. Love stopping by your blog...so pretty and bright. I hope you have a great week as well. Thanks for visiting. I love the sound of The First Third.